In something totally different in Red Sox Nation the Sox will be looking for the 2nd new manager in as many years. 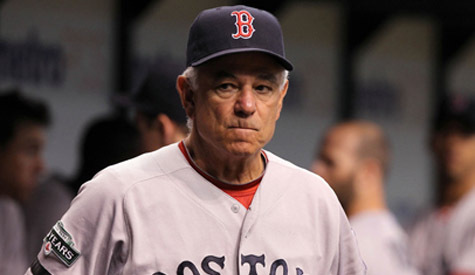 After Terry Francona’s 8 successful years at the helm in Boston Bobby Valentine barely made it through the one. So it’s back to the drawing board. While the Red Sox will look to several of the managers that they did the last time around they will be taking a wholly different approach in the winter of 2012. The structure of the team is entirely different this time around. Last year, in the wake of the September collapse and all that went down behind the scenes, the Sox were looking for someone stern and experienced who could keep the big contracts and big ego guys in line. They looked early at some up-and-coming guys with less experience but they clearly valued someone who had been in a major league dugout before and narrowed the field down to Valentine and Tigers 3rd base coach and former Pirates and White Sox manager Gene Lamont. Valentine won out in the end and as we saw the results were an utter disaster. He attempted to overcompensate for the coddling ways of his predecessor and wound up alienating many members of the team before the season was even off the ground. He never developed a great relationship with his coaching staff, even the ones that he chose himself. In the end Bobby V. wasn’t the right guy for the job. Fast forward to 2012 and it’s a whole different ballgame for Valentine’s future replacement. Gone is 71 and 1/4 million dollars from the Red Sox 2013 payroll with the subtractions of Kevin Youkilis, Adrian Gonzalez, Josh Beckett, Carl Crawford and Nick Punto. The big egos and big contracts have been reduced to John Lackey and, well, John Lackey. Two of their three remaining productive hitters from last year’s lineup, David Ortiz and Cody Ross, have expiring contracts. It’s a totally different landscape for the next Red Sox manager and one could make the argument that this situation is a much better situation for an up-and-comer to enter than the one that faced the new manager last season. And for that reason the names that were not good enough for the Red Sox last season may look a lot more attractive this time around. Of the 4 guys that the Red Sox interviewed last season only 1, Cubs manager Dale Sveum, is not available. Phillies bench coach Pete Mackanin has been fired and doesn’t seem like he’ll be in the mix this time around. That leaves two guys – Indians bench coach Sandy Alomar Jr. and Blue Jays first base coach Torey Lovullo. You could make a serious argument that those 2 guys are 2 of the top 3 on the Red Sox list for their next manager. 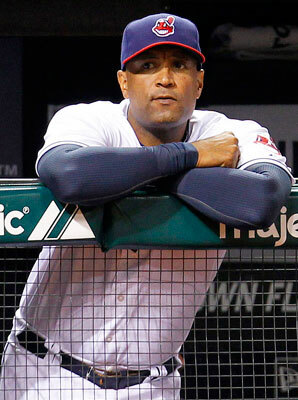 Alomar lost out on the Indians job to Francona and looks to be the next big managerial candidate in the majors. If not Boston he’s expected to be a contender for possible openings in Miami and Toronto. Then there is Lovullo who spent a year as manager of the Pawtucket Red Sox. With a younger generation of players coming up for the Sox it would be to Lovullo’s benefit to have familiarity with the Red Sox’ minor league system. There are other names in the mix, chief among them former Sox pitching coach and current Blue Jays manager John Farrell. I’d expect the Red Sox will spend the early part of next week surveying the situation with Farrell and the Blue Jays before deciding whether that avenue is one worth pursuing. I don’t expect them to dance around with the Blue Jays for too long before moving on Farrell or simply moving on. There are some pros and cons to bringing Farrell back but I’d rather get into that when its clear that he’s an actual candidate. Of course there are other names being thrown around, perhaps former Sox players Mike Lowell or Bill Mueller. Maybe Marlins bench coach Joey Cora who should be about ready to step out of Ozzie Guillen’s shadow after spending 9 seasons as his #2. His brother Alex played in Boston for four years. The picture should get a lot clearer early next week. After all unlike last season when in late August replacing Terry Francona would have thought to be unheard of, the Sox brass has probably been looking to the future since as far back as July. Either way remember the names Lovullo and Alomar. They may have not had enough experience for management last year but the dynamic of the team has changed and Ben Cherington may see one of these two guys as the right man for the job this time around.